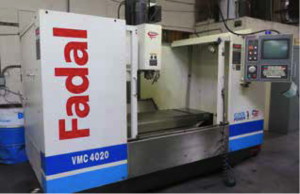 2000 Fadal VMC4020HT mdl. 906 CNC Vertical Machining Center s/n 01200060825 w/ Fadal MultiProcessor CNC Controls, 21-Station ATC, CAT-40 Taper Spindle, 10,000 RPM, Rigid Tapping, High SpeedCPU, Graphics, 20” x 48” Table, Coolant. 1996 Fadal VMC3016HT mdl. 904-1 4-Axis CNC Vertical Machining Center s/n 9610541 w/ FadalCNC88HS Controls, 21-Station ATC, Cat-40 Taper Spindle, 7500 RPM, 422K Memory Expansion, RigidTapping, High Speed CPU, Graphics, 16” x 36” Table, Coolant, 1997 Fadal VMC12RT mdl. 914 CNC Vertical Machining Center s/n 9705081 w/ Fadal CNC88HS Controls,21-Station ATC, CAT-40 Taper Spindle, 7500 RPM, 422K Memory Expansion, Rigid Tapping, High SpeedCPU, Graphics, 16” x 29 ½” Table, Coolant. 1992 Frejoth / Proto Trak mdl. FVTM-1 ½ 2-Axis CNC Vertical Mill s/n A0084 w/ Proto Trak MX2 Controls,2Hp Motor, 80-5440 RPM, 16-Speeds, R8 Spindle, 9” x 42” Table. Bridgeport / Proto Trak 2-Axis CNC Vertical Mill s/n 175288 w/ Proto Trak EDGE Controls, 1.5Hp Motor,60-4200 Dial RPM, R8 Spindle, 7” Riser, 9” x 42” Table. Bridgeport / Proto Trak 2-Axis CNC Vertical Mill s/n 210690 w/ Proto Trak A.G.E.2 Controls, 2Hp Motor,60-4200 Dial RPM, Kurt Power Drawbar, 9” x 42” Table. Mori Seiki SL-25A5 CNC Turning Center s/n 1295 w/ Fanuc 10T Controls, 12-Station Turret, HydraulicTailstock, 8” 3-Jaw Power Chuck, Coolant. Hardinge HLV-H Wide-Bed Tool Room Lathe s/n HLV-H- 1063 w/ Sargon Lathe-PRO DRO, 125-3000 RPM,Inch Threading, Power Feeds, Tailstock, Steady Rest, 5C Collet Closer, 6” 3-Jaw, 5” 3-Jaw and 5” 4-Jaw Chucks, Coolant. Mori Seiki MS-1250G 17” x 54” Geared Head Gap Bed Lathe s/n 8694 w/ Sargon Gold Tracer Lathe DRO,32-1800 RPM, Inch Threading, Tailstock, Steady Rest, KDK Tool Post, 12” 4-Jaw Chuck. Mori Seiki MS-850G 17” x 38” Geared Head Gap Bed Lathe s/n 10452 w/ 32-1800 RPM, Inch Threading, Tailstock, JFK Tool Post, 10” 3-Jaw and 4-Jaw Chucks, Coolant. Webb mdl. 13X40 13” x 40” Geared Head Gap Bed Lathe s/n 2187-1642 w/ 54- 2000 RPM, Inch/mmThreading, Tailstock, KDK Tool Post, 6” 3-Jaw Chuck. Acra Turn mdl. 1340 13” x 40” Geared Head Gap Bed Lathe s/n 52095 w/ 45-1800 RPM, Inch/mmThreading, Tailstock, 6” 3-Jaw Chuck, Coolant. 1991 Mitsubishi DWC110C CNC Wire EDM Machine s/n 501C238 w/ Mitsubishi CNC Controls, 20” x 26 ½” Table Area, 12 5/8” x 18 ½” Tooling Work Area, Coolant Filtration and Cooling Systems. 1991 Aratron E.D.M.450/75 Die Sinker EDM Machine s/n 011421 w/ Aratron V-PULS MM75 Controls and Power Source, RSF Z525 DRO, Rotobore Rotary Tooling Head, 6” x 18” Magnetic Chuck, 15 ¾” x 27 ½”Table Area, Cooling System. Eltee Pulsitron TR20 Die Sinker EDM Machine s/n 495 w/ Eltee Pulsitron Controls and Power Source,Sargon 3-Axis Programmable DRO, System 3R Tooling Head, 6” x 12” Magnetic Chuck, Cooling System. Falcon Chevalier FSG-1224AD 12” x 24” Automatic Hydraulic Surface Grinder s/n 36101 w/ Chevalier Controls, Wheel Dresser, 14” x 24” Electromagnetic Chuck, Coolant Particulate Filtration System. Bridgeport mdl. 815 8” x 15” Surface Grinder w/ Magnetic Chuck, Coolant. Ramco mdl. LF-618 6” x 18” Surface Grinder s/n 73426 w/ 6” x 18” Magnetic Chuck. Harig “Super 612” 6” x 12” Surface Grinder w/ Magnetic Chuck. (2) Deckel mdl. SO Single-Lip Tool Grinders s/n’s 82421, 0076 w/Diamond Wheels, Collets. Cosmo Single-Lip Tool Grinder s/n G-108106. Cuttermaster mdl. FCG-30 Precision Tool Grinder s/m 0734 w/5C Air Fixture, Diamond Wheel. Kelco mdl. CS22 Dry Blast Cabinet s/n C1489 w/ Dust Collector. Accu-Finish Series II Tool Lapper s/n AF29709. Baldor and Chicago Bench and Pedestal Grinders. Burr King mdl. 482 2” Belt Sander. (3) Baldor and Kalamazoo 2” Belt Sanders. 1998 Arch mdl. ARD-812DS 8” Column x 24” Radial Arm Drill s/n 281 w/ 88-1500 RPM, Power Column and Feeds, 16 ½” x 27 ½” x 15 ½” Riser Block. Kalamazoo mdl. 8-C- W 8” Horizontal Band Saw s/n 5318353. 2006 Kaeser ASD40 40Hp Rotary Air Compressor s/n 1074 w/Sigma Controls, 141 CFM @ 125 PSIG. Amcot mdl. ST-60 Cooling Tower s/n 98072. Torit mdl. VS-550 Dust Collector s/n 990704. Walker Turner Drill Press w/ Procunier 7-Spindle Lead-Screw Tapping Attachment. Rockwell Variable Speed Drill Press w/ Procunier mdl. MJ Multi-Drill Attachment. 1998 Arch mdl. ARD-812DS 8” Column x 24” Radial Arm Drill s/n 281 w/ 88-1500 RPM, Power Columnand Feeds, 16 ½” x 27 ½” x 15 ½” Riser Block. 2006 Kaeser ASD40 40Hp Rotary Air Compressor s/n 1074 w/ igma Controls, 141 CFM @ 125 PSIG. System 3R-242J and 3R-218/13 EDM Tooling Systems. (11) Kurt 6” Angle-Lock Vises. (130) R8 Tooling and Collets. (3) Troyke 12” x 12” Rotary Cross Slides. A &amp; B Motorized 5C Spin Fixture. Holdridge mdl. 4-S Radii Cutter Set. Carbide and HS Endmills, Drills, Reamers, Taps, Core Pins, Hardware and Cabinets. Starrett mdl. HGC2024-16 CMM Machine s/n B-1366 w/ Renishaw MIP Probe Head,20” x 24” x 16” Work Envelope, Computer, 32” x 32” Granite Table. Nikon mdl. 6C 10” Shadowgraph Optical Comparator s/n 6372 w/ Surface and Profile Illumination. 18” and 12” Dial Height Gages. Mitutoyo and Import 6”-12” OD Mic Sets. Mitutoyo OD Mics to 13”. Mitutoyo 24” Twin Beam Dial Caliper. Fowler and Kanon 24” Digital Calipers. (4) Standridge 24” x 36” x 3” Granite Surface Plates. Nissan 50 mdl. CPH02A25V 4548 Lb Cap LPG Forklift s/n CPH02-903664 w/ 2-Stage Mast, 130” Lift Height, Side Shift, Cushion Tires. Nissan 40 mdl. MCP1F2A20LV 3400 Lb Cap LPG Forklift s/n CP1F2-9P1809 w/3-Stage Mast 187” Lift Height, Side Shift, Cushion Tires. Nissan mdl. MCPL01A15LV 1650 Lb Cap LPG Forklift s/n CPL01-9N0544 w/ 3-Stage Mast 188” Lift Height, Side Shift, Cushion Tires. 2-Ton Portable A-Frame Gantry w/ Jet Electric Hoist. Storage Cabinets and Shelving, Work Benches and Shop Carts. Harvill 600 Ton Horizontal Cold Chambered Aluminum Die Casting Machine w/ Harvil Controls, 30” x 30”Between Posts, Gas Fired Bale-Out Furnace. Toshiba DC-500A 500 Ton Horizontal Cold Chambered Aluminum Die Casting Machine s/n 801338 w/Toshiba Controls, 25 ¾” x 25 ¾” Between Posts. Toshiba DC-500A 500 Ton Horizontal Cold Chambered Aluminum Die Casting Machine s/n 711248 w/Toshiba Controls, 25 ¾” x 25 ¾” Between Posts.